Week 7 – Lund to Campbell River..to…Portland! This week we took a little side trip to celebrate a BIG event! Happy Dance is moored up in Campbell River, BC, and we are currently in Portland, Oregon where we spent the weekend with family and friends commemorating Greg’s graduation from Pacific University. We had the opportunity to talk to Greg’s professors, spend time with lots of family and friends, and most of all, CELEBRATE!! 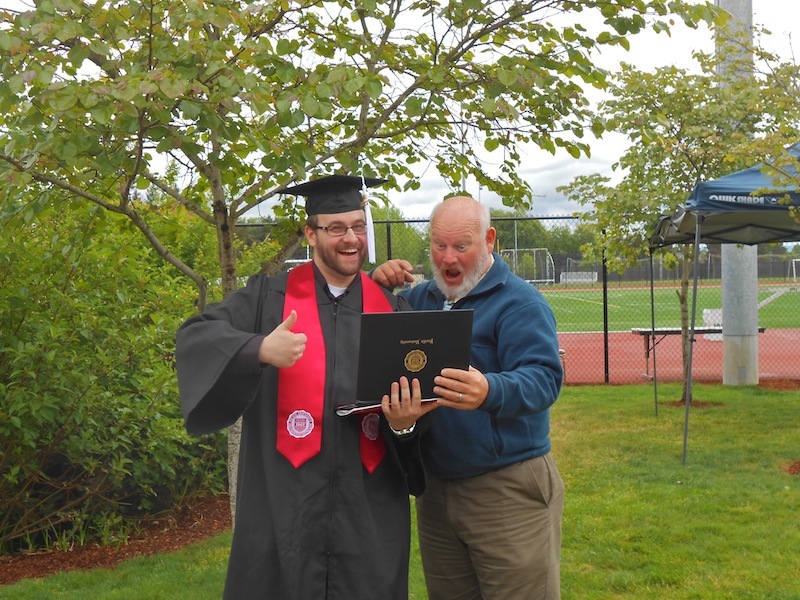 The rain held off for the outdoor commencement ceremony, then we enjoyed pizza and beer at Rogue Brewery, followed by plenty of yakking and silliness! We also had a few hours of scenic adventures along the Columbia Gorge, visiting Multinomah Falls and the Bonneville Dam. Tomorrow we head back to Happy Dance, buy a few groceries and head out! Hi Sue and Marty You do get around. 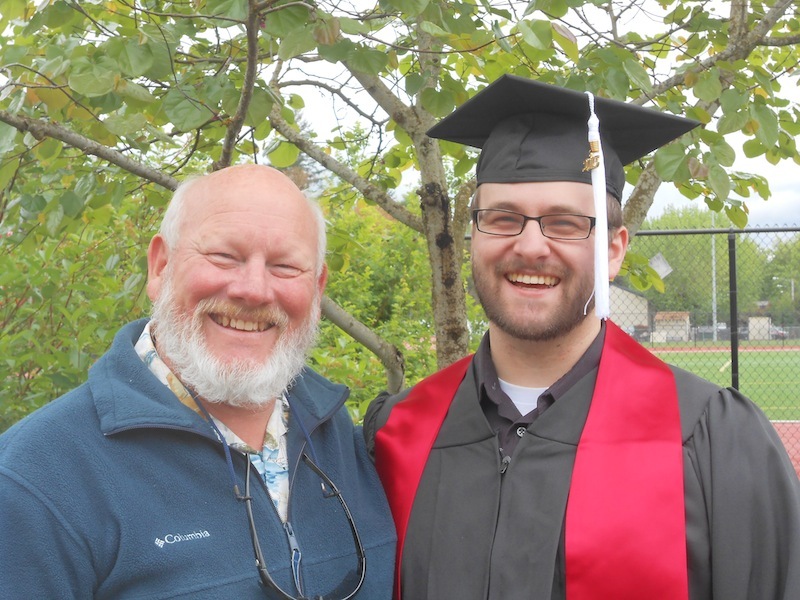 Congratulations on the graduation…very nice picture of the handsome grad and Dad. (Both). This is too funny .. 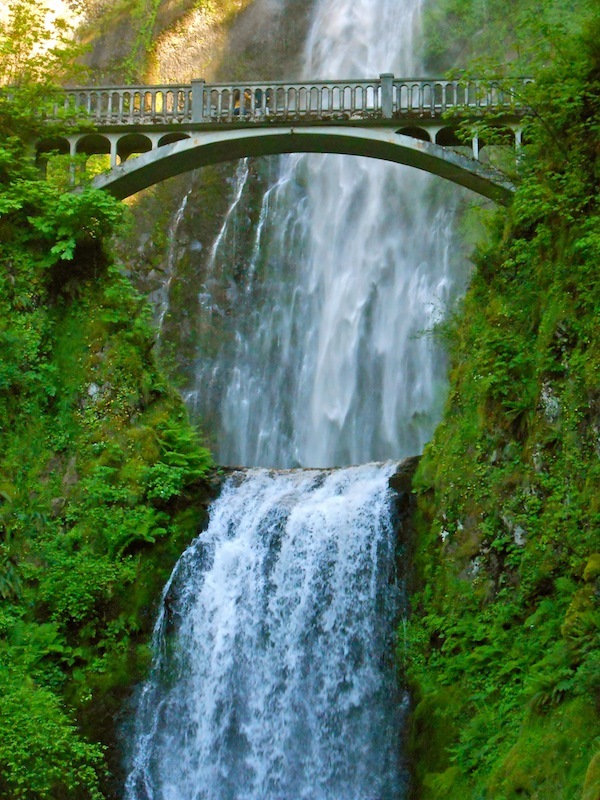 I haven’t been to Multnomah Falls in years, but I was there on May 16 just four days before you. Wouldn’t it have been fun to run into each other there! Looks like you had a nice sunny day. We did too in between days of downpours. Hi Mary! That is so funny that we just missed you at the falls, wouldn’t that have been a riot to turn around and find each other there! We had a nice afternoon at the falls and exploring the dam and fish hatchery – visited Herman the Sturgeon too…what a riot! Love ya! We were happy to share the weekend with you and everyone else in Portland. It’s great to have yet another McDaniel ‘Diplomat’. Proud Papa had almost as big a smile as Greg did – almost! It was a fun time and the McDaniel Clan remains alive and well. Go us! 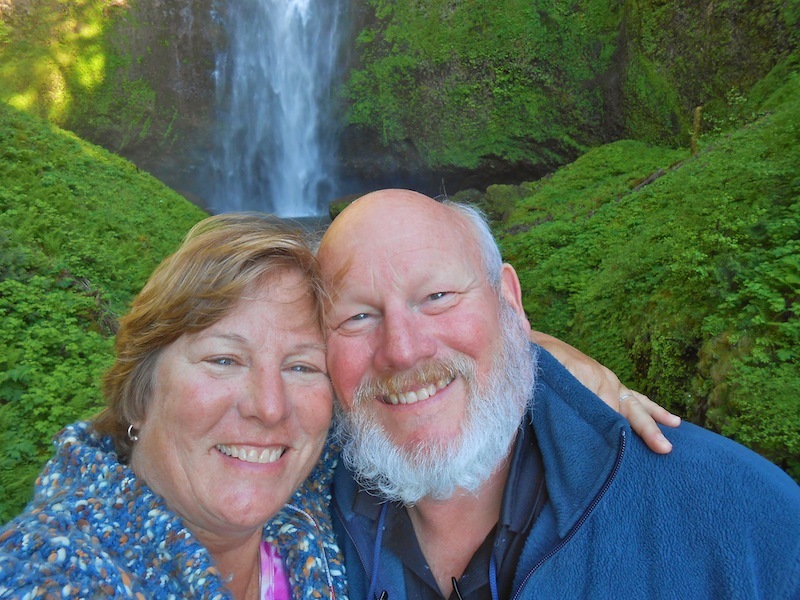 Sue, when did you start hanging out with the Travelocity Gnome? Wishing you safe travels as you start the next leg of your Grand Adventure. Have gnomie will travel! Though it does appear that the beard could use a trim! We were happy to be part of the celebration and very proud of Greg! Nice to know we have another ‘diplomat’ in the McDaniel Clan. Sue, when did you start hanging with the Travelocity Gnome? Safe travels back to Happy Dance and let the great adventure begin again.